Our 100words.ca photographer, my eldest son, opened his Bible to Ephesians and placed it among the ruins of ancient Ephesus on a door entrance to what was probably a Christian’s home or place of business. The circle with the symbols secretly represented the Christian faith. The other dark circles were so that people would not slip when entering. That Christ may dwell in your hearts through faith; that you, being rooted and grounded in love, may be able to comprehend with all the saints what is the width and length and depth and height — to know the love of Christ which passes knowledge; that you may be filled with all the fullness of God. Just imagine the overcoming strength Paul has received from God. He is writing this from a prison in Rome. Paul takes on the principalities and powers which manifest themselves in Caesar, the ruler who claimed to be a god. Who is truly free, and who is the prisoner? Paul’s prayer is not just for the believers at Ephesus, but for us too! To be filled with all the fullness of God means that we will be fuller than we were before when we were already full. How can this be? Our capacity for God living in us has expanded because of God answering Paul’s prayer! Let us keep topping up every day without fail! Here is a three-step plan for becoming more like Jesus: (1) Be strengthened with power through His Spirit, (2) Understand that Christ dwells in our hearts by faith, and (3) Get a grasp on the fact that Christ loves us totally. From my earliest days in public ministry, I established a practise of spending as much time in prayer as I spent in preparation for ministry. Keeping a balance between head and heart is vitally important. When the 100 Huntley Street daily telecast began June 15th, 1977, I knew that I was not to go on air unless I had spent at a minimum the same amount of time in prayer as I would spend on TV. I believe the Lord clearly showed me that failure to do this would result in my own thoughts being expressed and not His thoughts. I suggest we read Isaiah 55:6-13. How does one get wet when it’s raining? Just go out in the rain with the umbrella down. How does one get soaked in God’s thoughts? Through much prayer and the reading of God’s Word. His Word contains His thoughts! The Church of Mary in Ephesus, built around 200 AD, is a church of great historical significance. It is also known as the Double Church, because it is thought one aisle was dedicated to the Virgin Mary and the other to St. John. It has also been referred to as the Council Church, because the Council of Ephesus is believed to have been held here. It is the first church to take Mary’s name and the site of two important ecumenical councils in 431 and 449, in which the natures of Christ and Mary were hotly disputed. In Goreme Cappadocia in Turkey, the people built their homes into cone shaped hills and in Kaymakli they excavated deep below the ground for their city. These troglodyte cave-cities were excavated as early as Hittite times, and were expanded over the centuries as various marauding armies traversed Central Anatolia in search of captives and plunder. There are 36 underground cities in Cappadocia. Ruins of the Celsus Library…one of the most beautiful structures in Ephesus. It was built in 117 A.D. as a monumental tomb for Gaius Julius Celsus Polemaeanus, the governor of the province of Asia. The grave of Celsus was beneath the ground floor across the entrance and there was a statue of Athena over it, because she was thought to be the goddess of wisdom. Now, therefore, you are no longer strangers and foreigners, but fellow citizens with the saints and members of the household of God, having been built on the foundation of the apostles and prophets, Jesus Christ Himself being the chief cornerstone. Christians take note! Our position in Christ is established! By the end of the second chapter, we have the words “in Christ” (or its equivalent) 19 times. Are we beginning to get the message? We are no longer the walking dead! (verses 1-3). We have been raised up! We “sit together in the heavenly places in Christ” (verse 6). Verse 11 begins with “Therefore” (as the result of the foregoing), which is a turn-around word…(1) We are alive in Christ; (2) We experience the exceeding riches of His grace; (3) We are saved through faith, a gift of God; (4) We are created in Christ Jesus for good works (works do not produce any favour from God, but they follow as a result of His favour); (5) We are citizens of His Kingdom with all the privileges that pertain thereto; (6) We are family–His DNA can be traced within us; and (7) We are a holy temple, God’s habitation! We are “in Christ” and He is living in us! It is very, very humbling to recognize that, other than opening our hearts to Him, He’s done it all! Lord God, I pray that I will comprehend, as much as I have the capacity to do so, the magnitude of Your blessing on me. Please assist me to recognize that my behaviour does not determine Your blessing, but Your blessing determines who I am. Thank You! Thank You! Thank You! I am blessed! Blessed! Blessed! Amen!!! I made my lifetime decision to be a follower of Jesus at 16 years old, but it was not until I was 19 that I fully realized my position “in Christ.” It was then that I studied “The Doctrines of Salvation,” first in a Bible correspondence course and then in Bible College. The book “Lectures in Systematic Theology” by Henry C. Thiessen was a companion to my Bible. This book is for sale on Amazon or can be purchased on Kindle for iPad reading (click here). I find Thiessen’s teachings concise and carefully Biblical. In fact, I would recommend this study as foundational to every other Bible study curriculum. The words from today’s reading, “Chief Cornerstone,” stood out to me because of much time spent with our First Nations people. Over again and again, I heard them refer to their true Chief, Jesus Christ, as their “Chief Cornerstone.” I have the great honour of being an honourary Chief of the Oneidas. I’m reminded that Jesus is my Chief, now and forever! P.S. Yesterday was my son Ron’s 54th birthday. Ron and Ann’s daughter Andrea has her birthday on the same day! Ron pointed out to me this week that we had almost 32,000 blog readers’ comments. To you who are reading this and have never let me know, please do so today, if possible. I don’t get to answer each one, but I do read them all with thankfulness and prayers of God’s blessing on each person whose name I see. The Celsus Library facade has two stories with Corinthian style columns on the ground floor and three entrances to the building. There are three window openings in the upper story. They used an optical trick…the columns on the sides of the facade are shorter than those at the center, giving the illusion of the building being greater in size. Missionary to Turkey Mike Martin is pictured here amidst the ruins of ancient Ephesus (Present-day Selcuk, Turkey). This area is one large museum, perhaps the most spectacular ruins in Turkey. The Apostle Paul walked these streets witnessing for Christ, stopping from time to time to lift his voice and preach the Good News of eternal salvation in Christ. One of the Seven Ancient Wonders of the World was here, “The Temple of Diana.” The area pictured above is not open to tourists, but my photographer son, David Reynold, was able to enter to photograph for this blog. Thirteen times in today’s reading we find, “in Christ,” “in Him,” in Himself,” “in Whom,” “in the Lord Jesus,” repeated again and again. It’s plain to see that Paul has an absolutely clear message he fervently desires to communicate! In fact, the phrase “in Christ” or its equivalent appears 35 times throughout this letter to the believers in Ephesus, and the Holy Spirit intended these words for the whole Church in every place and throughout all time. Therefore, we should pay close attention to every word. What do we have “IN CHRIST?” “Heavenly places,” “He chose us,” “Redemption and forgiveness,” “purpose,” “all things,” “an inheritance,” “the praise of His glory,” “trust,” “the Holy Spirit of promise,” “the guarantee,” “wisdom and revelation in the knowledge of Him,” and “His mighty power”…and that’s just in the first chapter! This is mind boggling! We need to spend time meditating on these facts. If we are not overwhelmed, we need to check our pulses to make sure we are still alive! Lord Jesus, I want to personalize the prayer found in the key verse: Dear God and Father of our Lord Jesus Christ, I ask for the Spirit of wisdom and revelation in the knowledge of Your Person. Amen! Amen! I have had the privilege of visiting the spectacular ruins of Ephesus several times. I’m so impressed with the evidence of stately public buildings which once served the people. Of course, the houses in which the people lived around the centre and in the suburbs are not to be found. I have just read the story of Paul’s ministry in Ephesus again from the book of Acts. When I have stood in the great Ephesian amphitheatre, I can almost imagine the loud declaration of the crowd inside who were shouting in defence of their goddess, “Great is Diana of the Ephesians.” Paul and his team of witnessing Christians caused a riot (read Acts 18:24-28 and Acts 19:1-41 and check out the picture below for the theatre where the uproar happened). I didn’t cause a riot back in 1964, but most certainly consternation, when one Sunday evening I refused to preach my Salvation message in the pulpit of the church in Sudbury, Ontario, where I was the new Pastor. I checked the congregation out by upraised hands, and everyone present had the assurance of their eternal salvation. I then asked one of the deacons to take over the service and I proceeded out the door, down the alley for one block, to the sidewalk outside the Mine Mill Union Hall, where a dance was in progress. People were milling around outside the hall. I raised my voice and began to preach on how to have assurance of Heaven. I even noticed the Union President, Weir Reid, open his window across the street in order to listen. He was called “Canada’s last angry socialist” by the Toronto Star. Mr. Reid called me following this and offered, at no cost to the church, the use of their camp facilities for a week each Summer for a Christian camp. This was the initial seed for the Circle Square ranches, which continue to this day. I would not have been surprised if the congregation had convened a business meeting and dismissed their Pastor, me. I’d been there about three weeks. As it happened, I continued to serve there for almost five more years, and I don’t believe we ever had another Sunday evening service where someone in the congregation did not bring out a friend who did not yet know Jesus as Saviour and Lord. Every service found one, two or more at the altar giving their lives to Christ. The congregation, since that time on the street, has planted new congregations and built two new church buildings in order to hold the people and to serve the community. Forgive me for going on far beyond my goal of 100 words. Ruins of the ancient theatre in Ephesus (Acts 19:28-31). The Dung Gate is one of the gates in the walls of the Old City of Jerusalem. The gate is situated near the southeast corner of the Old City, southwest of the Temple Mount. And all the army of the Chaldeans, who were with the captain of the guard, broke down the walls of Jerusalem all around. This was a day of judgment! The capital city, the symbol of the nation, was destroyed by Babylon (modern Iraq). Things had never looked worse for God’s chosen people. Earlier they had been forcefully removed from the northern areas, and now from Judah and the city of Jerusalem. What of God’s promises now? What of the prophecies of the great future ruler who would reign forever, the Messiah, the Son of David? Look ahead! Israel was restored under leaders such as Ezra and Nehemiah. The Temple and the walls were built again. The people of God came to know a long period of peace and prosperity. Greatest of all is that in the course of time, just five miles south of Jerusalem, in the city of David, Bethlehem, Jesus was born. We move in our reading for tomorrow into the book of Ephesians. After reading Kings, I think we need the encouragement we will receive from the Holy Spirit-inspired letter to the Church at Ephesus! Lord God, fill me each day with the joy that comes from knowing that the darkness and despair that may seem to be all around is only temporary. Please help me to look to the eternal reality of Your plans for my future. Plans that are greater than anything I could imagine. In Jesus’ Name I pray. Amen!!! I’m taking the time today to read at one sitting the entire book of Ephesians. We’ll consider over the next six days, God willing, the life-enriching and life-changing truths which Paul writes to the people of Ephesus, the largest city of what was then known as Asia Minor (modern Turkey). Paul spent two years there sharing the Good News of Jesus and establishing the church. Now he writes back to these people who are so precious to him. What joyful assurance he brings his loved ones! This is powerful teaching! Perhaps it’s obvious that I’m excited about the week ahead before we move back again into the books of 1st and 2nd Chronicles, which present more of a spiritual history of the dynasty of King David. The books of 2nd Samuel and 1st and 2nd Kings, which we’ve just completed, are more of a political history. I hope and pray for staying power for each reader. I call it sanctified stubbornness! Never give up!! I pray that there will be steel up each backbone which will never bend to the pressures of daily life that might steal away the great blessings which God has for us. Amen!!! Norma-Jean and I at Sea Level on our way down to the Dead Sea, which is over 1,300 feet below Sea Level. This was during our last trip to Israel 2 years ago. This photo is of the model of the Temple in Jerusalem at the time of Jesus. This magnificent structure was constructed by King Herod and was destroyed by the Romans in 70 A.D. On today’s Google map, you will see where this model is located in Jerusalem; the original Temple stood just 300 yards to the northeast. Today the location of the Dome of the Rock Muslim shrine is just to the south of where the Temple was situated. We are now being introduced to Nebuchadnezzar, a King who will show up in our readings more often in the remaining Hebrew Scriptures than any other foreign monarch. God is very patient, as is demonstrated again and again in our readings about the kings of Judah, but He will not forever endure disobedience and the flagrant misuse of His name. The practices established by Moses in the Tabernacle, and enhanced by Solomon in the Temple, were continuing. But the Kings who did evil in the sight of the Lord had added the idol worship of other religions. The peoples of Israel and Judah continued to be known as the people of God, but for most of the time, they did not act in a manner honouring God. God finally refused to see any more evil done in His Holy Name. God hurled enemy after enemy against Judah until it was a mere shadow of its former self, and it became a mere puppet of foreign rulers. Let us not despair. God was working all things after the counsel of His will. He had His faithful people amongst the captives taken to Babylon. Check out Daniel 1:1-6. Lord God, even as You had people who were faithful to You when evil deeds were government policy in both Israel and Judah, so You have those in our land who refuse to compromise their personal standards of righteousness. I pray that I may ever be one of those who serve You with all my heart, as did Daniel and the three Hebrew youths who, even though they were forcibly removed from Jerusalem, served You with integrity. In the Name of the One who served You most faithfully, Jesus, I pray. Amen! While I use the common term to describe Israel, the “Holy Land,” it is by no means “holy” today. For example, the destruction of innocent life, known as abortion, is rampant amongst secular Jews who make up the majority of the population. The evil kings of ancient Judah in our recent readings burned children as sacrifices to the god Molech. Today little bodies are burned in an incinerator. The same atrocity is happening here. There is no protection in our country for a child up until the moment he or she exits the womb. I believe that the reason God is still merciful to modern Israel and to Canada is because there are people who grieve and repent for national sins against God on a daily basis. I know that our Queen, our official Head of State for Canada, is grieved deeply by the evil of abortion, but as a constitutional monarch, she does not have the power of a Hezekiah or a Josiah to change things. Our government is also powerless to protect these little ones until a clear majority of the members of the House of Commons and the Senate come to abhor the practice of abortion. Back in the 1980s, we had a Minister of Health, the Hon. Jake Epp, who succeeded in getting a bill through the Commons with some protection for these little lives, but this bill was defeated in the Senate by just one vote. I pray daily for leaders, those who hold life as a sacred gift of God, to rise up, run for elected office, and form the majority of our lawmakers. I not only pray but I work for such people, regardless of party affiliation. NOTE: Today’s blog posting was mistakenly sent out yesterday. It was fixed by noon and the email was re-sent. Sorry about that! This is the view looking south from the temple mount in Jerusalem where the Kidron Valley joins the Valley of Gehenna. In today’s reading, the Valley of Gehenna is referred to as the Valley of the Son of Hinnom (2 Kings 23:10). Then the king stood by a pillar and made a covenant before the Lord, to follow the Lord and keep His commandments and His testimonies and His statutes, with all his heart and all his soul, to perform the words of this covenant that were written in this book. And all the people took their stand for the covenant. Three times in our key verse the word COVENANT is repeated! A covenant is the most solemn and most binding agreement into which two parties can enter. In verse two we read, “The king…read in their hearing all the words of the book of the COVENANT which had been found in the house of the Lord.” The King himself read the book out loud to all the people. What an experience this was! Imagine the loud voice of the young king ringing out across the crowded plaza. As did the people, will we commit with all our hearts and souls to perform the words of the covenant? According to Hebrews, for the past 2000 years we have had “A better COVENANT, which was established on better promises.” We may want to read (out loud if possible) Hebrews 8:1-13 & 2:11-15. Let us meditate on this amazing grace of God through our Lord Jesus Christ. Almighty and eternal God, I am amazed that You would bind Your Self to such an eternally binding covenant with me and all who will personally sign the covenant with all our hearts and souls. You signed in blood at the cross. I am absolutely confident that You will keep Your end of this eternally and legally binding agreement. The courts of Heaven witness to Your signature, and those same courts rang with great joy when I signed on, and they continue to celebrate over each new name written in the Book of Life. Grant that I may bring another person to sign in today, I pray. In the Name of the “Mediator of the New Covenant,” Jesus my Lord and Saviour, Amen! 1. What insight you make David. If we (as in this generation) fail to reach-out to the next generation, the Word of God will be something we only see as an article on a shelf in the museum. Christ must be our life, we need to be filled daily anew with His Holy Spirit, and then go forth in His service. We mustn’t miss the opportunity to proclaim the gospel, for life in this world passes quickly. 2. Please don’t think for a moment that this blog is a chore. This blog has brought me renewal and great joy every day! I’ve been a Christian for 30 years, but have never felt so alive in my Christian walk as I have this last year. Thank you David for bringing this to us daily, you’ll never know how it has enhanced my Christian walk. I can’t wait to see what you have in store for us in 100words for this next year. God Bless you for being a faithful servant in bringing this to us every day David. The southern wall of the temple mount in seen on the left and in the distance are some of the thousands of graves on the slopes of the Mount of Olives. You can even see a Jewish funeral service taking place. In todays reading, verse 6, the ashes of the wooden image King Josiah had burnt were thrown on the graves of the common people. Facing the Mount of Olives on the eastern side of the Old City of Jerusalem is The Golden Gate, also called The Eastern Gate. The Bible indicates that Jesus passed through this gate many times while He was in Jerusalem. Jewish religious tradition teaches that the coming Messiah will enter Jerusalem through this gate. To prevent this, the Muslims sealed the gate in 1541 A.D. during the rule of Suleiman. Like the walls around Jerusalem which were built for protection, may we build around our families the protection of the teaching of the things of God. In our reading two days ago, King Hezekiah tore his clothes to show his strong grief. Now Hezekiah’s great-grandson, Josiah, 18 years old, tears his clothes to show his extreme grief because his father, Amon, and his grandfather, Manasseh, had utterly failed to serve the God of the Book, and Judah had, for 57 years, reverted to the practice of false religions. How could this be? Isaiah, such a mighty man of God, had taught and preached over four generations of Kings from Uzziah to Hezekiah. Hezekiah’s son and grandson led the people away from the true and living God, living evil lives. Does this not prove that we are only one or two generations away at any time from the demise of the Church? If we fail to reach the next generation for Christ, a terrible turning away from God happens. Do we do our part with a passion in teaching Sunday School, in mentoring young people, in strong intercessory prayer for the next generation? Do our church services include strong Bible teaching which is contained in the Hymns and songs as well as the sermons? Do we succeed in communicating thoroughly the things of God? We should read again how this is to be done for the eternal good of the next generation…Deuteronomy 6:1-25. Lord God, keep me within the sound of Your Word. I need to hear Your thoughts every day without fail. I pray also that I will be enthusiastic in communicating Your Word to others, particularly to the next generation after me. Please give me wisdom in how I am to do this. I’m here Lord, please use me for Your great cause. In Jesus’ Name I pray. Amen!!! I’ve just looked at the picture of my great-grandson, Myles Neilson. I often put my arms around Myles when he slows down a bit (he loves his great-grandpa), and I share a story of God’s wonderful love. How thankful I am that, unlike Josiah’s father and grandfather, his parents, Sheryl and Todd Neilson, and his grandparents, the Staceys, love and serve the Lord. Below is a photo of Myles with me that we took in the park next to his home a couple years ago. As this picture was taken by his Mom, I was sharing the amazing story of the boy king, Josiah. I’ve been doing this blog for almost five years now, and those who’ve been with me since the beginning will now be almost through the entire Bible 2-1/2 times, moving back and forth between the Testaments. I trust that no one who participates with me is finding the blog boring or that it has become just another duty. I’m praying fervently every day that the experience will be alive, life giving, and life changing! May the Word of God always be a mirror in which we see ourselves as we really are; a Sword which will cut away those things which weigh us down in our service to God; a Light to guide us into God’s will, keeping us faithful in the way of Truth. For new visitors to this site, you can start today and in just 24 months you’ll have made the entire Bible part of yourself. Great goal! My seven-year-old great-grandson, Myles Neilson is one of eleven. Hezekiah and Josiah were also great grandson and great grandfather. These ruins are located about 100 metres south of Hezekiah’s Tunnel. In the summer of 2004, these remains were discovered of a very large pool from the Second Temple period. It proved to be the Pool of Siloam. Nearby, archaeologists uncovered the remains of a stepped street (photo at bottom of page), the path taken by pilgrims ascending from the pool to the Temple Mount. Beneath the paving stones of the street they found a drainage channel that apparently served as a hiding place for the last Jewish rebels against the Romans in the year 70 AD. The pool ceased to function after the destruction of Jerusalem and, over time, filled with earth and disappeared from sight. God added 15 more years to Hezekiah’s life by a combination of divine healing and medicine. Isaiah prescribed a poultice, which was to be placed on Hezekiah’s boil in order to draw out the poison that was in his system. God works in our time also through this combination of prayer along with the best medical care, with which we are blessed. God hears and answers prayer! Just as God heard Hezikiah’s prayers for deliverance from the Assyrians, God hears and answers prayer today. Do we have need for God’s intervention? Yes! Yes! God will hear our fervent prayers. That does not mean that God will always do just as we ask; He knows better than we do. Our faith is best expressed in obedience to do as He has told us. We pray, believe Him for His perfect will, and the rest is up to Him. Pray! Obey! Read James 5:13-18. Then God will do what God will do! Lord God, I pray for others (name them) and for myself as Hezekiah prayed, “Remember now, O Lord, I pray, how I have walked before You in truth and with a loyal heart, and have done what was good in Your sight.” Thank You, Lord, that You are hearing my prayer. I know Your decisions are on the way. In Jesus’ Name. Amen! I know from personal experience that God hears and answers prayer. As a result of God’s healing power, combined with the medical skills of the doctors and nurses, He has already added 61 more years to my life than the doctors predicted when I was 19 years old. The students in the Bible College in Peterborough, Ontario, went into a time of fervent prayer on my behalf, and two of the ministers/teachers anointed me with oil, laid hands on my head, and prayed in the Name of Jesus for my healing. God heard and said, “Yes!” The doctors then did surgery to correct the problem which had caused my illness in the first place. This is the bottom end of the stepped road and drainage channel, known as the Path of Pilgrims. In this area was a stone-paved plaza from the Second Temple period that served as a promenade for visitors to the Pool of Siloam. The promenade’s roof was supported by a row of stone columns, parts of which have been found at the site. This photo was taken near the top-end of Hezekiah’s Tunnel, or the Siloam Tunnel. 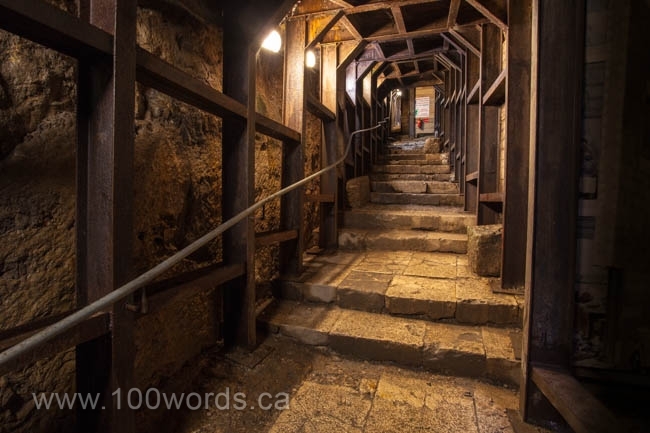 It is a tunnel that was dug underneath the City of David in Jerusalem in ancient times. It dates from the reign of Hezekiah of Judah (late 8th and early 7th century BC) and corresponds to the waterworks mentioned in 2 Kings 20:20. The tunnel, leading from the Gihon Spring to the Pool of Siloam, was designed as an aqueduct to provide Jerusalem with water during an impending siege by the Assyrians, led by Sennacherib. Now Therefore, O Lord our God, I pray, save us from his hand, that all the kingdoms of the earth may know that You are the Lord God, You alone. Our reading begins with the statement, “Hezekiah …. went into the house of the Lord.” The tearing of Hezekiah’s clothes and the sackcloth were evidences of extreme fervency. When we fast, the same fervency is indicated. Jesus practised fasting and encouraged us to do the same. This is evidence of our determined focus on God; it is not a way of earning God’s favour. Everything we receive from God is pure grace (undeserved favour). We learn from Hezekiah the power of prayer! Four times we are presented with the words “prayer, prayed, pray, prayed.” We get it, Lord! Isaiah, the man of God, is introduced here for the first time. Let us check on Isaiah’s preaching. He began his ministry when Uzziah was king and continued throughout the reigns of Jotham, Ahaz, and Hezekiah. As a youth, Hezekiah would have sat under the teaching and preaching of Isaiah, no doubt comparing the message and the life of Isaiah against the wickedness of his father Ahaz. Read Isaiah 1:16-20 and Isaiah 2:1-11, and then consider Isaiah’s experience of God recorded in Isaiah 6:1-8. We can be sure that as a youth, before he became king, Hezekiah had prayed the words of Isaiah to the Lord, “Here am I! Send me.” The results of this prayer are very evident in history. Lord God, I’ve heard Your call. You have said, “Whom shall I send, and who will go for Us?” I respond with those powerful words, “Here am I! Send me.” I pray this in Jesus’ Name! Amen!!! I was about to turn 17 when I attended Lakeshore Pentecostal Youth Camp for a week. It was there at the altar in the tabernacle that I prayed approximately this prayer with all my heart, “Lord Jesus, I want to serve You fully in Your great cause. Please Lord, do me the great favour of calling me into the ministry with a definite call so that I will know You have called me, and so that I will never turn back from serving You.” He gave me an unmistakable call almost immediately when the Youth Evangelist came to where I was kneeling in the middle of hundreds of other teens and said, with authority in his voice, “You are called into the ministry of the Lord Jesus Christ!” I’ve never doubted that call for even one minute for the past 64 years. In reference to today’s reading, my English teacher in high school had us memorize the poem “The Destruction of Sennacherib,” by Lord Byron. I remember it to this day… “The Assyrian came down like a wolf on the fold, and his cohorts were gleaming in purple and gold….” Lord Byron was a student of Holy Scripture (click here for the entire poem). P.S. In 11 days we’ll be half-way through the entire Bible. If you have just started reading with me, in 104 weeks you’ll finish the entire Bible, moving from the Hebrew Scriptures to the Greek, the Old Testament to the New, alternating between the two. Please tell others about this blog and encourage them from time to time to stick with it throughout the entirety of the Bible. Throughout the years, I have become convinced that with the two-year reading plan, over 70% of people who start to read with me complete reading the entire Bible. In the one-year plan, which I promoted for years, only about 30% completed the entire Bible. I discovered this because of the requests (or the lack thereof) for additional study materials. Up until 2004 this exit from Hezekiah’s Tunnel was thought to be at the Pool of Siloam. However, you will see in tomorrow’s 100words blog photo that the recent discovery, just 100 metres to the south, was in fact the Pool of Siloam. That is where Jesus, in John 9:7, after spitting in the dirt and putting it on a blind man’s eyes, told him to wash in the Pool of Siloam, and the man was healed. Hezekiah’s capital city… Jerusalem. This present-day photo is a northeast view looking toward the Temple Mount area. Hezekiah’s own father had been one of the most evil kings of Judah. Somehow, in one generation, God changed the direction of this family and of Judah. God found a young man, 25 when he became king, who made a life-long decision to turn from the wicked ways of his father, live a holy life, and lead his people back to the God of Israel. Our decisions change us for the better or the worse. Lord God, please hear my prayer when I ask for Your help in making the right decisions for my life and for my testimony to others. Thank You that I can change from the past, moving into a glorious future because of Jesus, Your Son and my Saviour and Lord, in whose Name I pray, Amen! The basic content of the message that God called me to bring two years ago to a gathering of Christian leaders in Jerusalem was one of repentance for harbouring any hatred or even disrespect towards Arabs or Jews. Such contempt is sin against our Creator God whom the Bible says is “Love!” Yes, He judges people and nations and He reserves that right for Himself. I’m so very thankful that I am not anyone’s judge! I am to love unconditionally! It’s time to pray fervently, particularly with President Trump in Jerusalem this week.